OWC introduced a new Four bay 1U rackmount offering up to 12TB capacity and 24Gbps of total throughput. Prices start at $499.99. Other World Computing (OWC®) http://www.macsales.com, a leading zero emissions Mac® and PC technology company today announced new OWC Mercury Rack Pro mini-SAS 4-Bay 1U rackmount solutions starting at $499.99 MSRP that combine four 6Gb/s storage devices (or data channels) with up to 12TB of capacity into the convenience of one port and one cable connection for the ultimate in data throughput rates up to 24Gb/s (2400MB/s). The mini-SAS port equipped Mercury Rack Pro is like having four eSATA outputs for the ultimate in data transfer rates, but "bundles" those four channels of data output into the convenience of a single cable connection. Now SMBs, SOHOs, and creative production professionals have a simple, high performance, yet cost-effective mass storage solution that reduces cable complexity. For massive capacity with the highest degree of drive access flexibility, the Mercury Rack Pro mini-SAS can be immediately used like a four bay drive dock. All four drives in the Mercury Rack Pro show up as individual drives, so users can then mix and match drives of any size and brand and hot swap the drives. The Mercury Rack Pro mini-SAS can also be used to RAID drives in a desired array with the additional purchase of third party RAID software or a SAS-SATA RAID controller card. Featuring a trayless drive bay design, the Mercury Rack Pro mini-SAS makes drive management, access, and replacement ‘slide and swap’ easy. Removable rack mounting ears and included anti-skid feet also allow the Mercury Rack Pro mini-SAS to be quickly and easily converted for desktop use. 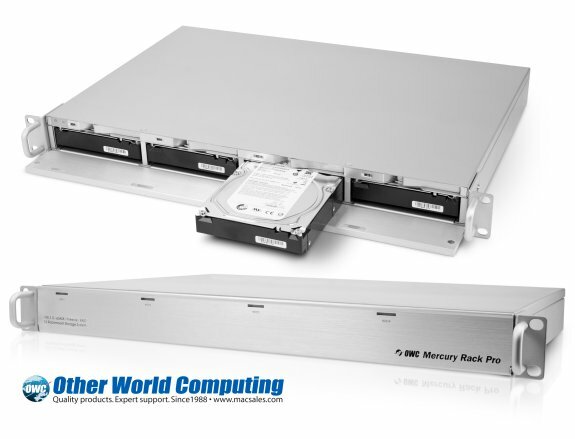 While all OWC Mercury Rack Pro mini-SAS standard solutions are covered by a two year warranty, Enterprise models use Enterprise class SATA hard drives manufactured to tighter specifications intended for the more demanding requirements of 24/7 server environments. As a result, Enterprise editions of the Mercury Rack Pro mini-SAS are covered by a five year warranty which includes a one year overnight cross-ship warranty and three years of Level One Data Recovery services, if needed.